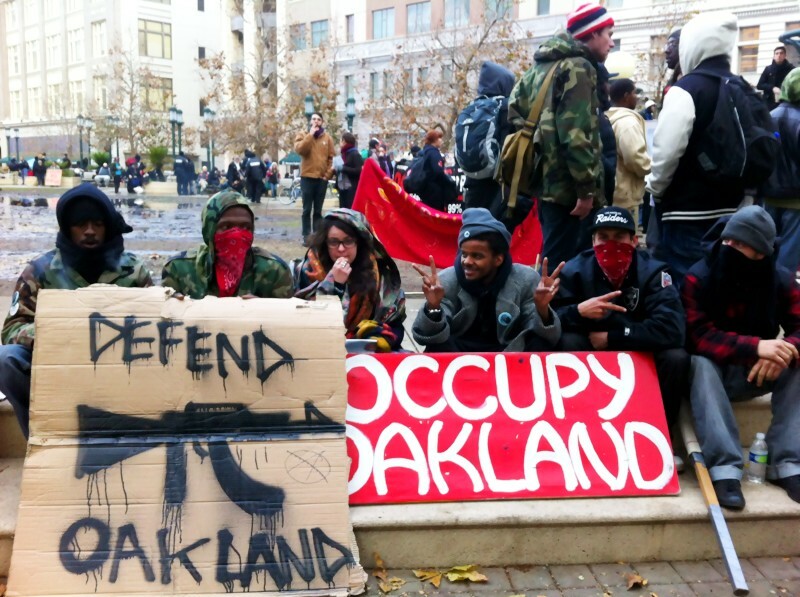 OAKLAND, California — On Monday, in coordination with numerous other West Coast “occupy” groups, Occupy Oakland has blockaded the port of Oakland in an attempt to halt the flow of goods which serve to further enrich the capitalist class. These synchronized actions involve blockades in Anchorage, Seattle, Portland, Los Angeles, San Diego and solidarity protests in Hawaii, Dallas, Chicago, Boston, New York, Houston and beyond; and though the event has not been endorsed by the ILWU, it was planned in solidarity with rank-and-file dock workers struggling against grain exporter EGT, which has been trying to undermine union contracts. 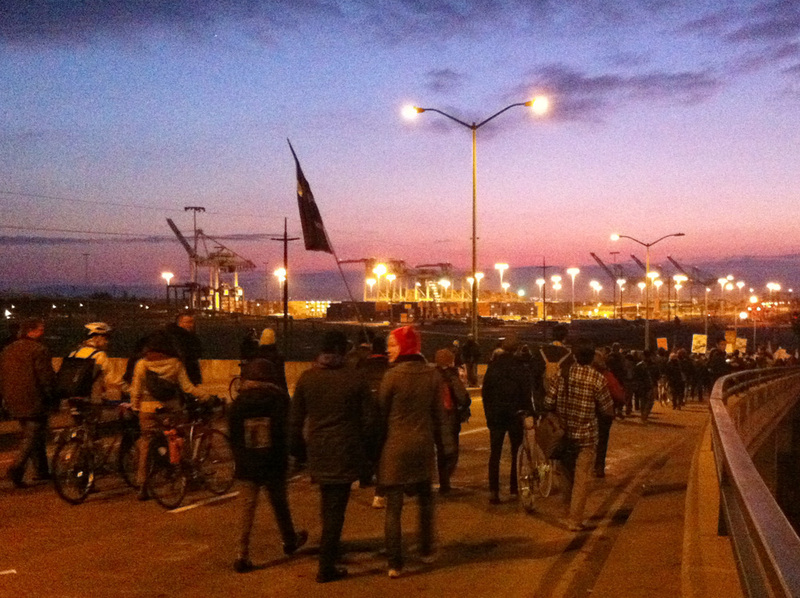 Early morning, before dawn, the port of Oakland was effectively blockaded by 1300-1500 demonstrators. There are around 300 protestors at each of the half-dozen Berth entry-points. The numbers continue to swell as protestors march from the West Oakland BART station. Read below for updates. LOS ANGELES, California — Despite uncharacteristically poor weather two brutal arrests, a rally of approximately 300-400 occupiers has shut down parts of the Port of Long Beach, which is the largest Port of entry in the United States. LBPD has announced that the demonstration is an unlawful assembly and is attempting to corral the crowd back into a near-by park (ironic, given the resources spent recently getting occupiers out of parks). 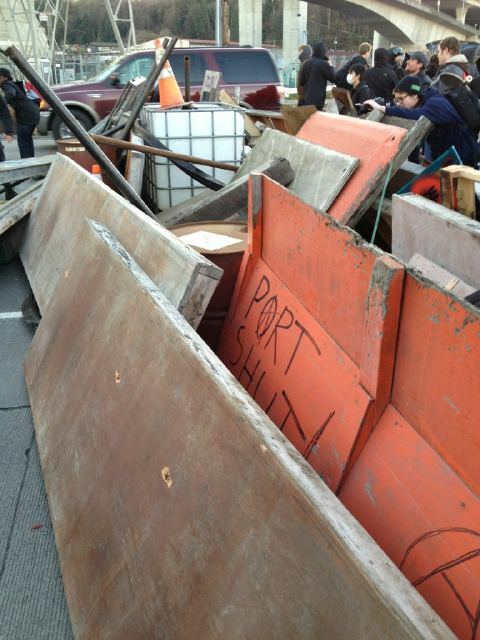 As of around 10am, demonstrators were forced to leave the intersections blocking the ports. SAN DIEGO, California — Similar to the #OccupyLA port shut down, demonstrators blocked a terminal beginning around 6am with small crowds of approximately 150 at two intersections, a north and south gate. Police dispersed demonstrators at the south gate around 9:45am, arresting at least 4. As of 11:30am demonstrators are still rallying at the north gate, however trucks are able to get in and out of the port terminal. As of around 4pm they’ve regrouped at Chicano Park to plan for further direct actions. PORTLAND, Oregon — Demonstrators have been effective in shutting down two terminals of the Port of Portland, with about 400 protestors at each gate. Police are reported to be targeting specific individuals and preparing to disperse the blockade with riot gear. Later, in the evening a third terminal was also shutdown. BELLINGHAM, Washington — A hundred or so demonstrators have blocked commercial railroad tracks since noon; some have u-locked their necks together to prevent them from being moved. Beginning around 3pm, the demonstrators with u-locks were being arrested. Watch it live. Around 5pm the last of the demonstrators were cleared from tracks. LONGVIEW, Washington — Work was cancelled today for longshoreman at the Longview port, so a small rally was held in solidarity with the west coast port shutdown. SEATTLE, Washington — Hundreds gathered in Westlake Park around 1:30pm. As of 2:30pm, they’ve begun to march to the Port of Seattle. By around 3:15pm, a growing crowd has reached the port. Watch it live. Police are in riot gear and appear to have pepper spray and rubber bullets ready. VANCOUVER, Canada — A few dozen attempted to block ports early in the morning on Monday, resulting in a disruption for about an hour. A rally held midday gathered more demonstrators who marched over to the port, but the police presence prevented a blockade. 5 were arrested in police confrontations. HOUSTON, Texas — Protesters who have chained themselves together face-down on the ground, to block trucks from entering the port there have been contained and detained by police in a large inflatable tent, presumably as part of an attempt to remove and arrest them. Rumors that the tent was to be used for administering a gas of some sort appear to be mistaken; the tanks were for inflating the tent. DENVER, Colorado — In solidarity, a handful of demonstrators from #OccupyDenver gathered in front of a Walmart distribution center in Loveland, Colorado. 13 arrests were made after demonstrators began to block a truck entering the distribution center. The demonstration ended around 5pm. 10:06AM: Arbitrators give the official word that the Oakland port is shut down. 11:04AM: Day-shift canceled in Portland. 1pm – A few berths are open at Oakland now due to dwindling numbers blocking the port, a few scabs, and police presence. However organizers are urging people to go to the 3pm rally at Oscar Grant Plaza and march at 4pm. Alternatively, there is a march at 5pm from West Oakland BART station. Organizers are saying the 1300-1500 folks that came at 5am this morning to shut down the port were successful in shutting down the berths with ships. These ships were unable to load cargo. Around 3 were arrested at one of the berths. Live at the port. 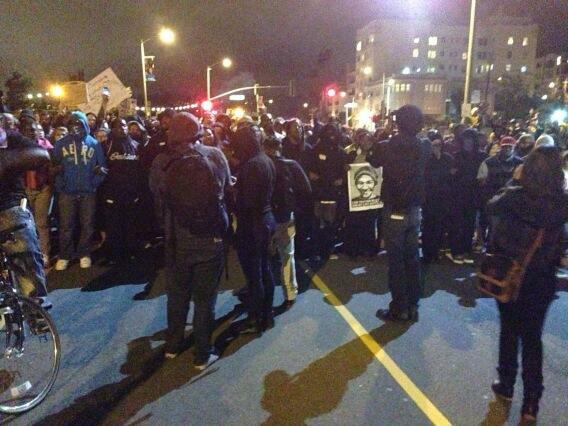 Live at Oscar Grant Plaza. 1:30pm – Port blockers in Oakland are asking for donations of food, water, usb-powered back up batteries, and beer. 3:25pm – One of the entrances to the Port of Seattle is shut down. 4:10pm – Oakland begins to march on port. 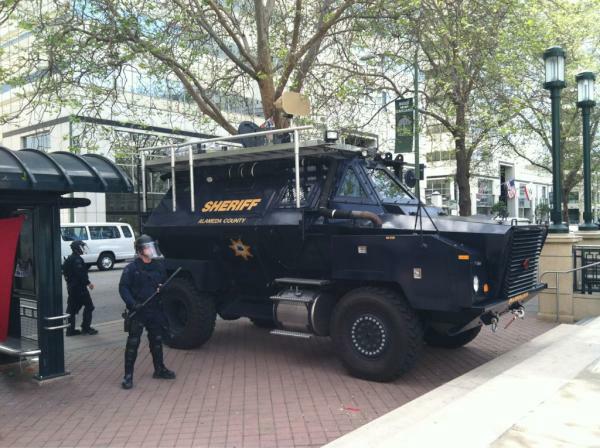 The march from OGP to the port takes a little over an hour, watch it live. 5:00pm – Oakland arrives at port. In Seattle police begin to attack port blockers as they try to remove makeshift barricades. Tear gas, flashbangs, and pepper spray have reportedly been deployed by police. At least one demonstrator was trampled by a police officer on a horse. 5:20pm – Ports have called off work for the evening shift in Oakland. 5:50pm – Seattle port blockers still holding it down at Terminal 18, Terminal 5. While trucks and other traffic is open, no workers appear to be in Terminal 18; however Terminal 5 appears to still be working. Around 8-9 were arrested in the earlier scuffle including 2 marked medics. 6:05pm – Police appear to be staging to clear the Seattle port blockers. 6:40pm – Police appear to now be leaving the port in Seattle – seemingly corroborated by a reporter from the mainstream media. 8pm – Oakland Commune decided at their General Assembly moments ago to continue the port shutdown into tomorrow in response to police brutality at many of the other shutdown locations. 2am – While demonstrators have been holding down the port of Oakland all day and all evening, they’ve begun to picket again in preparation for the next shift of workers. They need around 100 people at all of the berths of the port of Oakland. 3:45am – Port workers are being sent home. Arbitration – the process by which solidarity strike clauses and safety issues are resolved to satisfy legal requirements for workers to be sent home – is not needed, as bosses told workers the shift is cancelled. People are discussing to end the port shutdown extension now after 24hrs. Supportive ILWU rank and file members spoke to blockers and asked them to end the shutdown to continue to stand in solidarity with longshoreman’s interests. Port blockers calling it a victory and have voted to go home. Occupiers have regrouped at La Placita Church. A general assembly will be held tonight (Wednesday) at 7:30pm on the steps of City Hall. LOS ANGELES, California – Johannes Mehserle, the police officer that murdered Oscar Grant on New Years day 2009, has spent the last 10 months or so in prison. He has a court date on June 1st, and may be released as early as the middle of June on good behavior. CALIFORNIA – Johannes Mehserle, the BART police officer who shot and murdered Oscar Grant on New Year’s day, will be having a Bail hearing on Friday, December 3rd to request to be released while he appeals his involuntary manslaughter charge. While on December 2nd, the mass arraignments for the Oakland 152 begins and will continue onto December 3rd, and 6th. 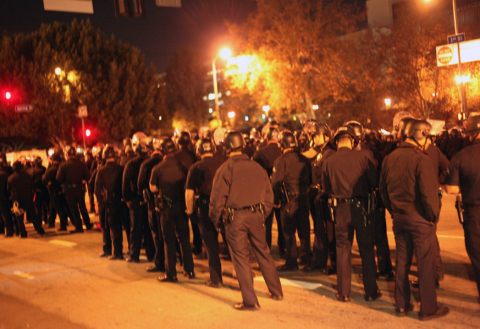 The Oakland 152 were mass arrested during the evening of November 5th after the sentencing finished. LOS ANGELES, California – BART police officer Johannes Mehserle murdered the unarmed Oscar Grant on the platform of Fruitvale station in Oakland on New Year’s day, 2009. This past July, Mehserle was charged with involuntary manslaughter, and today Judge Perry sentenced Mehserle to the minimum two year prison sentence, with time served. [Edit]: It’s unclear what amount of time total he is expected to spend in prison. Some reports suggest time served may include 292 days (double the time he’s already spent in jail), or that he may be released in 72 days. [Edit]: According to SFExaminer, Mehserle has 293 days applied to his sentence. CALIFORNIA – BART police officer, Johannes Mehserle, shot and killed unarmed Oscar Grant in January of 2009 while Grant was laying on his stomach at the Fruitvale train station in Oakland. Mehserle was charged with involuntary manslaughter on July 8, 2010, followed by thousands in the streets and rioting that evening in protest of the lax charge. Mehserle is to be sentenced this Friday in Los Angeles. 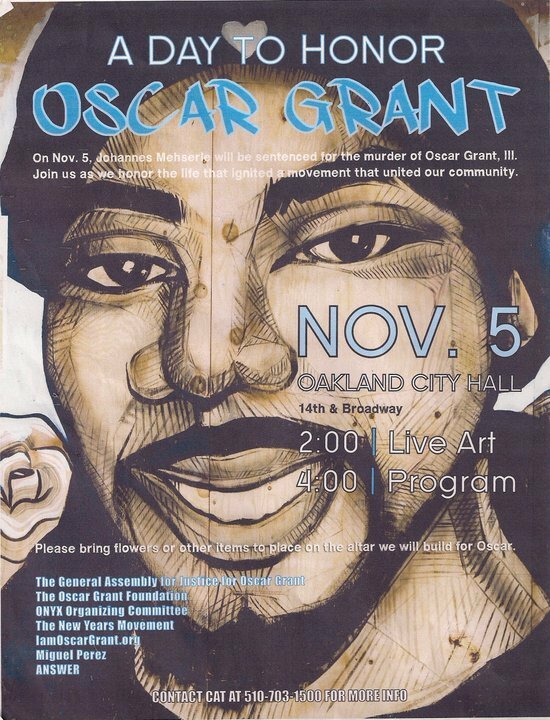 In Oakland, organizers from the Oakland General Assembly will be holding a ‘Gathering in Honor of Oscar Grant’ starting at 2pm in Frank Ogawa Plaza (14th and Broadway). RSVP on FB for the day of action in Oakland. RSVP on FB for the rally in Los Angeles. As the trial of former transit cop Johannes Mehserle for the murder of Oscar Grant rushes at breakneck speed toward its conclusion, spurred by the insistence of Judge Robert Perry and political imperative, ominous clouds of injustice begin to crowd the political horizon in anticipation of a verdict, which could come as soon as this week. But while it is this injustice that we should most fear, too many are focusing their fear and the fear of others on the possibility of a repeat of last year’s street rebellions should Mehserle be acquitted or convicted of a lesser charge. On January 1st, 2009, Oscar Grant was murdered by Bay Area Rapid Transit Police officer Johannes Mehserle in Oakland, Calfornia. Now Mehserle is on trial for reportedly the first ever on-duty police murder case in the state of California. The judge is pushing for the case to be finished by the 4th of July. Community members are already criticizing the trial as unfair as serious issues of bias in favor of Mehserle have sprung up including a jury without any black jurors. 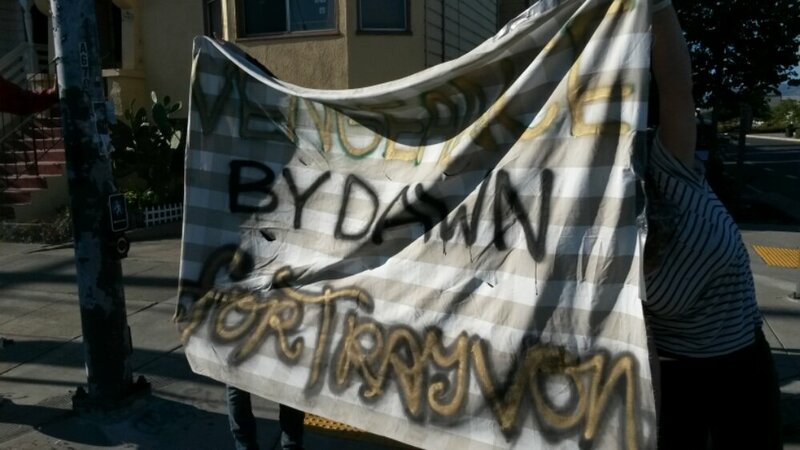 Activists from the bay area have called for action on the day of the verdict in Oakland on 14th and Broadway at 6pm, regardless of the outcome. 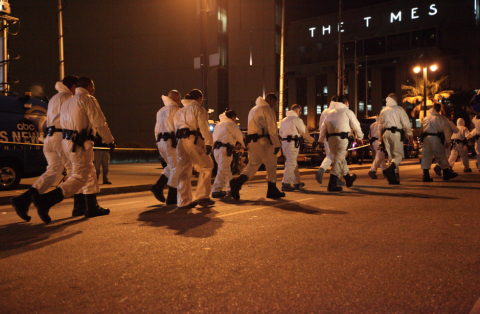 Actions have also been planned in Los Angeles where the trial is being held. More on indybay and OaklandForJustice. RSVP on facebook for more updates.